The Bottom Line: Large avalanches may be easier to trigger on persistent weak layers after the recent storm. Winds may create reactive wind slabs in the alpine. Choose your routes with these in mind. Step back if you find signs of instability such as shooting cracks, hear whumphs, or find slabby snow over weaker snow. The East Central Cascades picked up from 2.0" to .3" of snow water equivalent, depending on location. Snow accumulated rapidly as goose feathers fell with cold temperatures initially, then the temperatures warmed up and the winds blew. This caused a widespread natural avalanche cycle throughout the Cascades. Many large paths ran in the area, entraining wet snow as the debris ran through the water saturated lower elevation snowpack. Most of these appear to have ran within the storm snow, but some may have taken out persistent weak layers. It appears that it rained up to around 5,000ft, but uncertainty remains regarding how far down the water percolated into the snowpack. A number of folks have talked about how the sun is becoming stronger already. This may have caused a wet loose cycle on Wednesday and Thursday. Recent large slide off the north side of Wedge Mountain that entrained wet snow and broke some burned trees. Large avalanches will be easier to trigger after the recent storm added to the slab over the weak layer. To the east of Hwy 97, the main concern lies in triggering the whole snowpack to the ground, and a funky layer of crusts, facets, and surface hoar in the mid-pack down a foot or two. As recently as the 24th, an observer noted an "earth shattering WHUMPH!" at 5,000ft near Blewett Pass. Here, the snowpack is shallow and largely variable. Avoid areas with thick slabs adjacent to thin, rocky slopes. 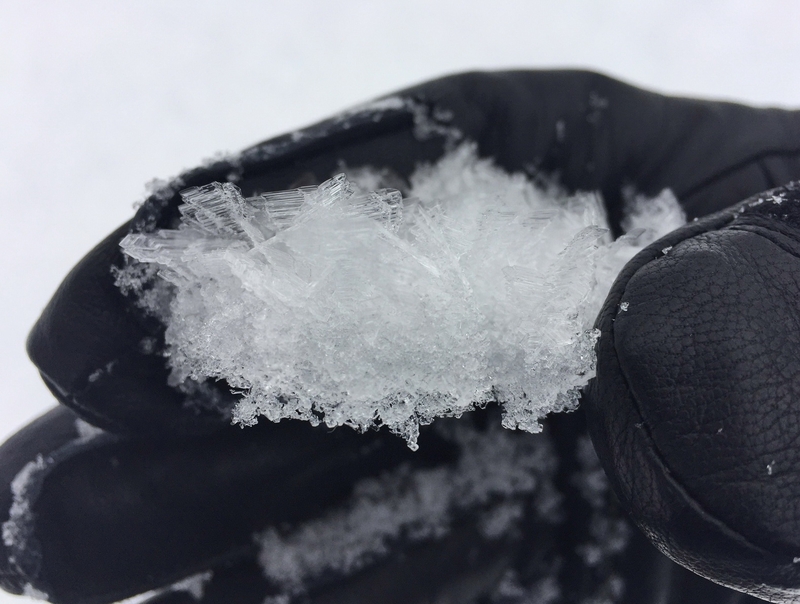 Further west, the main layer of concern is a layer of surface hoar that was buried on the 17th. You can find this layer down a foot or two west of Hwy 97, and will be most readily preserved on sheltered, shaded open slopes from 4,000ft to 6,000ft. Look for shooting cracks, and listen closely for whumphs. Snowpack tests can also help identify these weak layers. Lack of evidence in one profile or test often isn't enough information to make sound decisions from. Avoid getting up underneath steep slopes, travel conservatively with these layers in mind. Put a large buffer of terrain between where you travel and any steep slopes. Slides may wrap around terrain features and surprise you and your group. A bump in winds from the northwest may transport snow from cold, north facing slopes up in the alpine. Where snow is redistributed, dense slabs may form. Freshly drifted slabs are likely to be more reactive. When you find more than 6” of snow has drifted in or accumulated, it’s time to evaluate it. You can check how the new snow is bonding by using small, inconsequential test slopes and quick hand pits. Is there strong over weak? Are the slabs cohesive enough to crack? If so, it may be best to steer clear of firm, slabby snow on steep slopes.